Creating and printing math times tables has never been easier with our Free Times Table software. 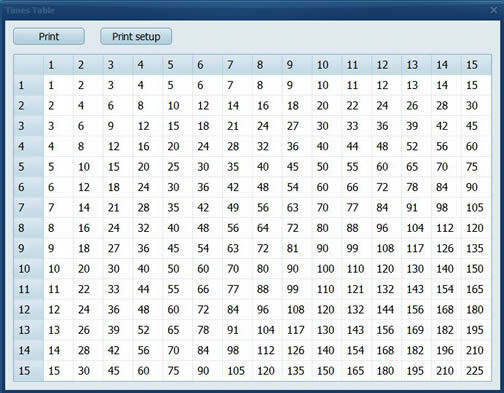 Simply enter the numbers you want the times table to represent, select a font size and click print! We all know that maths can be a real nightmare. Unless you are a natural when it comes to this subject, if you don't practice enough or you're unable to focus on the lessons, you are most likely on your way to some nasty problems. Thankfully, in modern world there are many technological facilities that can help a person to get back on the right track. When you're in primary school, one of the biggest mathematical issues is memorizing a multiplication table. Kids come home, study and ask their parents to examine them. Some of them are excited by the task, others are too lazy to really come round to it. No matter to which group your child belongs (or you - if you are a student and looking for help yourself), we present you with the solution that will make learning easier for both of you. Don't hesitate to check out our Times Table application. You could ask why in the world should you install something like that on your PC - after all, you not only have it in your head but you can also print it from the internet any time you want. The reason is simple - every kid needs few printed versions of the times table to put it in his pencilcase, pin it to the door of his room or to the fridge. However, he is also likely to lose it a few times. So having Times Table app on your disk is actually the most convinient way because you can teach your child to print it by himself (making him remember all the steps of finding it via internet would be slightly more difficult). As for the gadget itself, it's extremely easy to use (so even your kid won't have any troubles). After running the app, a small window pops up and all you have to do to get the multiplication table of your choice is deciding between few given options. It gives you control over what you will print - though most likely, you would just like to carry on with typical table that goes from one to ten, so that's what is suggested. But you can change the start and end values (on lines x and y) and fill them with the numbers from 1 to 900. What's at least equally important, you can also choose the size of the table - they range from very small to very large. That way you can print them in few different sizes, depending on where your child will use them. It is also useful if your child wears glasses. After pressing "create multiplication table", you get the one you've just chose. It's very plain to make it more functional. Now you only have to print it. The app allows you also to choose your printing preferences. As you see, we give you a feature with all the options you might need to help your kid (or yourself) with a difficult task. Good luck!